This webpage is an explanation of using the field stop plane in the widefield fluorescence illumination for photo uncaging or activation. 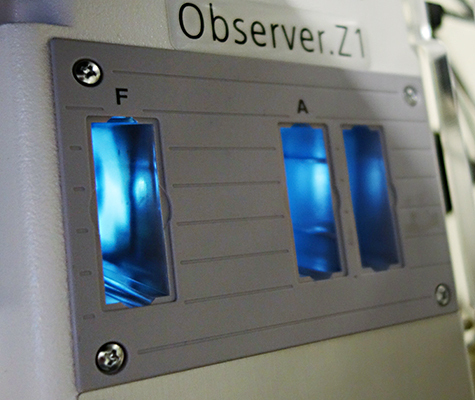 The Zeiss 700 has lasers at 405, 488, 555 and 639 nm. Any of these may be parked at a specific location as a diffraction limited spot or scanned over a larger user defined location. However, an experiment may need illumination at 360 nm instead. To do this a small apurture (any shape) may be inseted in the field stop plane of the microscope body and the area to be exposed moved to the location of the projected light. Limitations are that the illumination may be low since this microscope is at Kohler illumination rather than brighter critical illumination, the sample has to be moved to the spot, and there is a few seconds lag between the UV illumination and the first confocal image that may be collected. Get image of a test sample. Put aperture in field diaphagm slot and get image of the location of the spot. Mark this onthe screen or in the ocular so that you can move the area to be exposed to this location. Using light that does not damage sample, move area to be uncaged to location of spot. Switch to ocular and expose to UV. Switch back to confocal and image. At the right rear of the microscope body there are three slots for filters/apertures. The "F" slot may have a field diaphagm or any shaped hole put in it. This allows for projecting illumination only in a subset of the field. To test this, we took a piece of cardboard, poked a hole in it with a pen tip, and inserted it. The result was an in focus spot of illumination. On the left is illumination of the entire field with the position open. On the right is an image of the hole in the cardboard. The position of the hole was measured roughly by putting the carboard over the neutral density filter slider which is normally in the rearmost unlabeled slot. And we need a better pinhole than the test one used here. We need a 25 mm diameter disk with precision cut aperture to put in this slider (they may be purchased from Thorlabs) or we may make our own. We can also make our own slider.